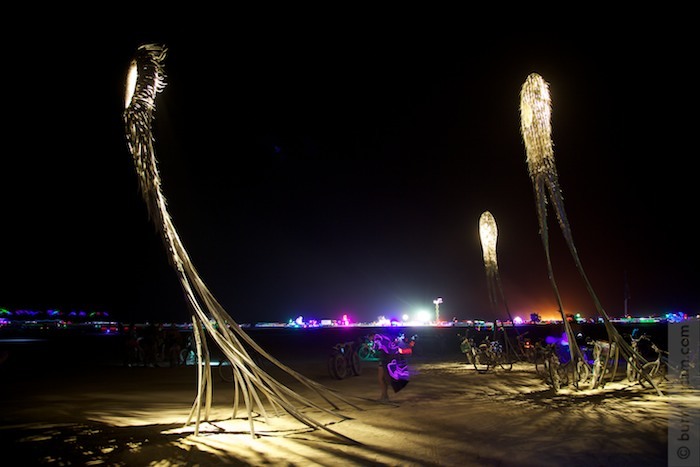 Caption: Night-time drifts on my last evening on the playa. Jennifer and I went for a final roam, and here they were. The place was a forest of bikes when we arrived. That’s sort of understandable, as they’re a useful fixed landmark. But also doesn’t seem terribly respectful. I mean, c’mon! This is art, not a bunch of lampposts for tying up your bikes! A fellow photographer, whose name I didn’t get, and I shifted some of the bikes over so we could get a picture of the shadows cast upon the ground.